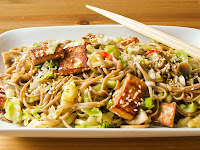 I whipped this up for lunch the other day with some leftover bits I had in the fridge and it was so quick (about 15 minutes), easy and delicious! 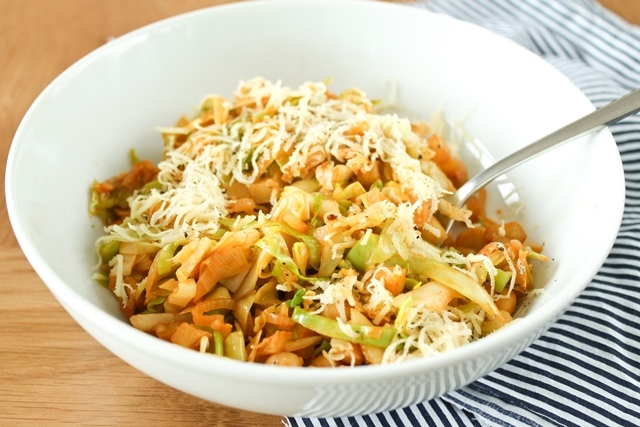 Recipe is based on and adapted from Heidi Swanson's White bean and cabbage from Super Natural Every Day. If you've been following my blog for any length of time you'll know I love her. Easily my favourite blogger and cookbook author, simply everything I've ever made by her has turned out and been stunning, most have become regular staples in our house. I made quite a few changes to this one only because I suppose I was in that mood - changing things about a bit, quantity wise and with what I had on hand. Mostly, I have added a smoky aspect here using smoked paprika and smoked sea salt as those flavours go so beautifully with cabbage and potatoes. Further, I used chickpeas as I had some leftover in the fridge but also as I prefer them to white beans in this type of dish. Lastly, I grated some Vegusto mild over top in place of the parmesan and it just finished the dish off perfectly. It has a sharp taste reminiscent of an extra mature cheddar and was gorgeous with this. • 70g baby new potatoes (about 2), scrubbed and diced tiny - leave skins on. 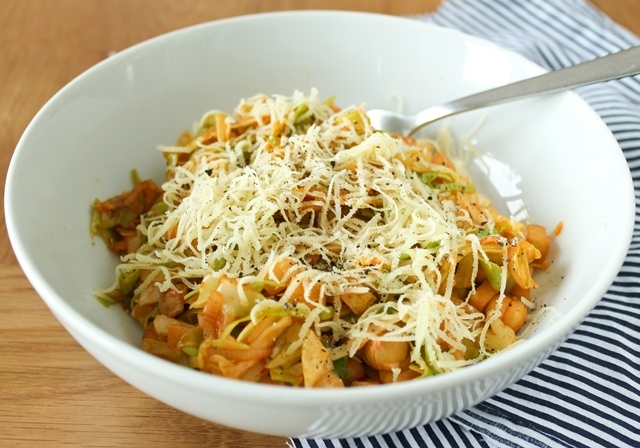 • Vegusto mild or piquant, finely grated - cheezly parm would be nice too. Heat the olive oil in a large frying pan, skillet or as I used, wok - but make sure you have a lid or something you can fashion as a lid. 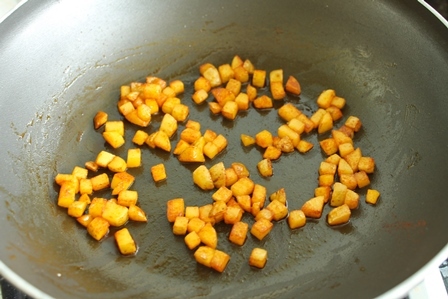 Add the tiny diced potato, ¼ tsp of the smoked paprika and 1/8 tsp of the smoked sea salt and stir. Pop the lid on and fry gently, removing the lid now and again to give it a stir, until the potato is cooked and getting slightly crispy, about 5 - 7 minutes. 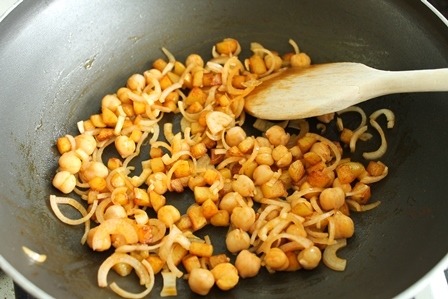 Add the shallots and chickpeas and fry until the shallots are soft and the chickpeas are heated through and getting slightly browned. If it seems a little dry pop the lid on to let things sweat a little. Add the cabbage, the other 1/8 tsp of smoked sea salt and the other ¼ tsp of smoked paprika and stir well. 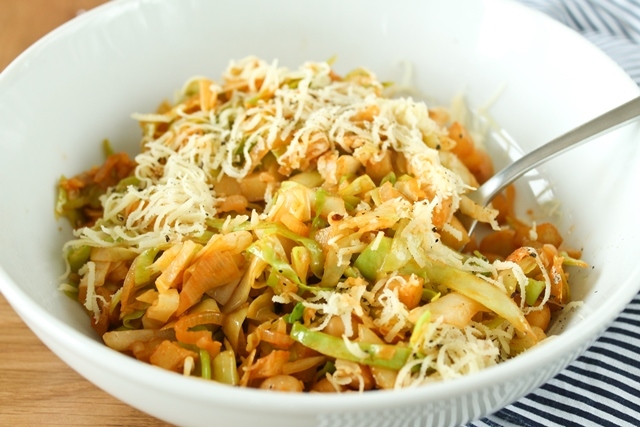 Add a splash of water - about a tablespoon and fry over medium heat until the cabbage just starts to wilt and any excess liquid is cooked off. Transfer to a bowl and top with a good grating of Vegusto mild and some freshly ground black pepper. Enjoy! this looks delicious! i love cabbage and chickpeas together in a stirfry but it's been much too long since i've made one. time to change that!